History class and I didn’t really get along. Most of the time the teacher sounded just like Charlie Brown’s teacher…wah wah wah…something about Chinese dynasties. Because the lessons didn’t contain stories that I could latch onto, just “facts” and dates, it all sounded like static to me. I memorized. I passed. But it all rolled off of me as soon as I turned in my test paper. The one exception was 7th grade New York State history. “No textbook,” said Mr. Hiteman. “We’ll learn by doing.” And that’s exactly what we did. We spent afternoons at a dig site excavating around a cellar hole, then diligently cataloguing our artifacts. For the final exam, we wrote an essay using those artifacts to reconstruct the life of the home’s inhabitants. History felt 3-D and static-free that year. History seeped into me without any effort. History was, for once, alive. 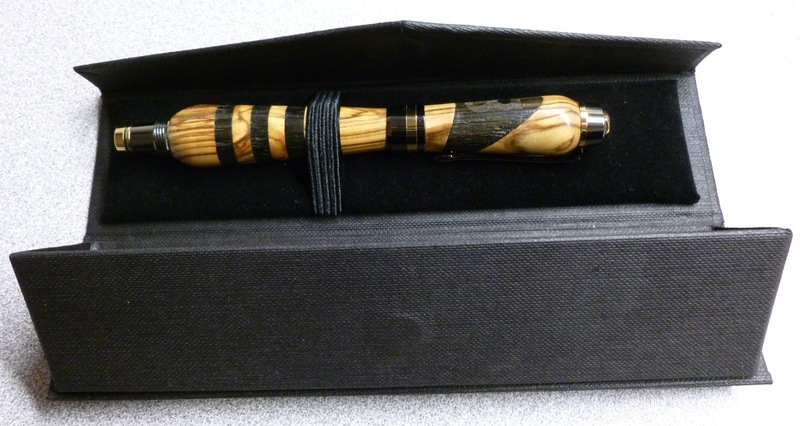 The primary wood in this pen is Bethlehem Olivewood (Israel), which is nearly 2000 years old. Though the trees are protected, the branch trimmings and deadfall are made available to woodworkers and tourists. Two thousand years. Wow. If wood could talk. The accent wood, Bog Oak, is even older. These ancient woods have been preserved in the peat bogs of Ireland and England for 3500 to 5000 years. Life in the bog gave the wood its rich dark color. Married together, in a process shown in this video, the woods come alive again in allegory’s pens, and I think the result is pretty cool. 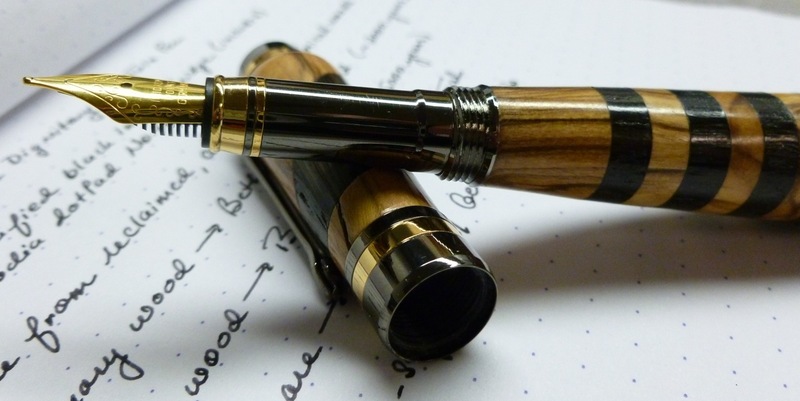 As my pen collection grows, I find myself looking for pens that offer something out-of-the-ordinary, and The Dignitary certainly fits that bill. It’s unique “bulbous” shape isn’t something that you see every day. And though I think it looks and feels a little top-heavy when posted (6-1/2″), I find holding the unposted pen (4-3/4″) to be very comfortable. And the look has really grown on me. (To be honest, I wasn’t crazy about it at first, which is why I didn’t spring for one until the second project.) 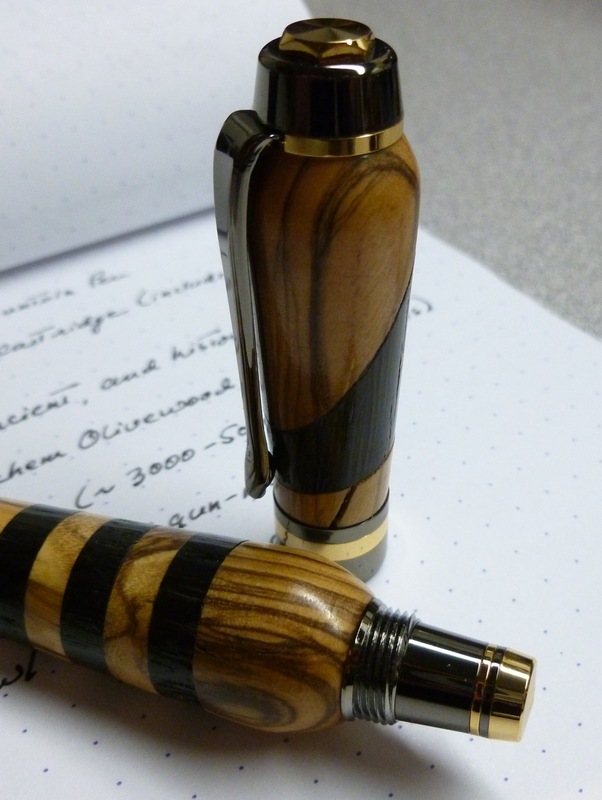 The shape makes the pen fun to hold, the weight is lovely, and the wood is warm. 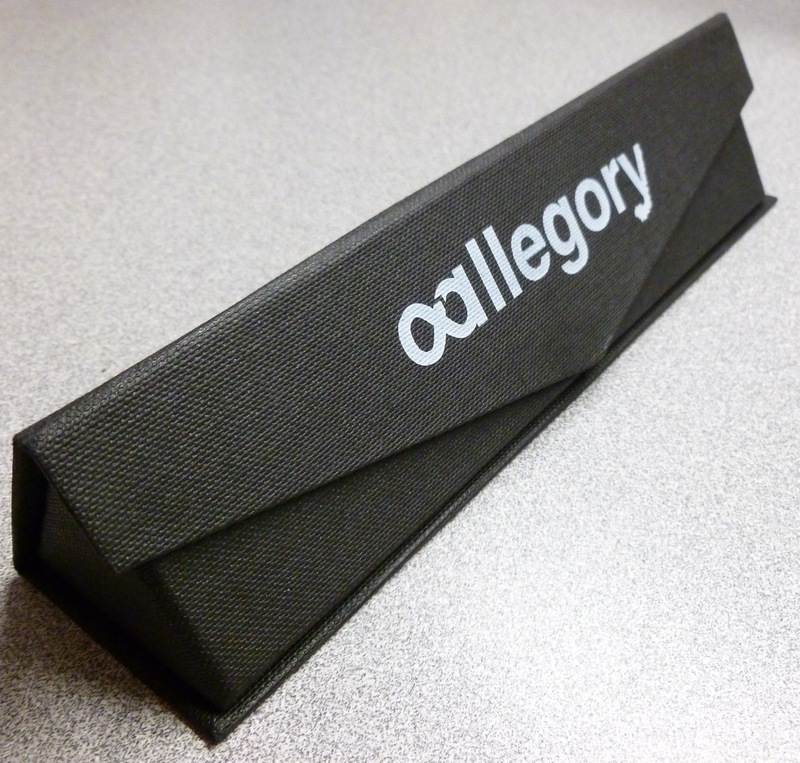 Speaking of posting, the cap screws onto the back of the pen so that it stays put. You don’t have to worry about the cap coming loose and falling off. I’m a sucker for gunmetal, so the accents on this pen suit me fine. The gunmetal section is fairly narrow, but I haven’t had any problems with slippage. The unmarked nib writes a medium(ish) line and flow is on the wet side with no hard starts or skips. An unspecified black cartridge came with the pen. I’m not enough of a converter expert to know which one might fit, so I’ve just been using the included cartridge for now. As with anything handmade from ancient materials, there may be imperfections in the wood. I noticed a crack only after looking at this enlarged photo. This doesn’t bother me, but allegory pledges to offer an exchange if you are unsatisfied for any reason, so no worries there. 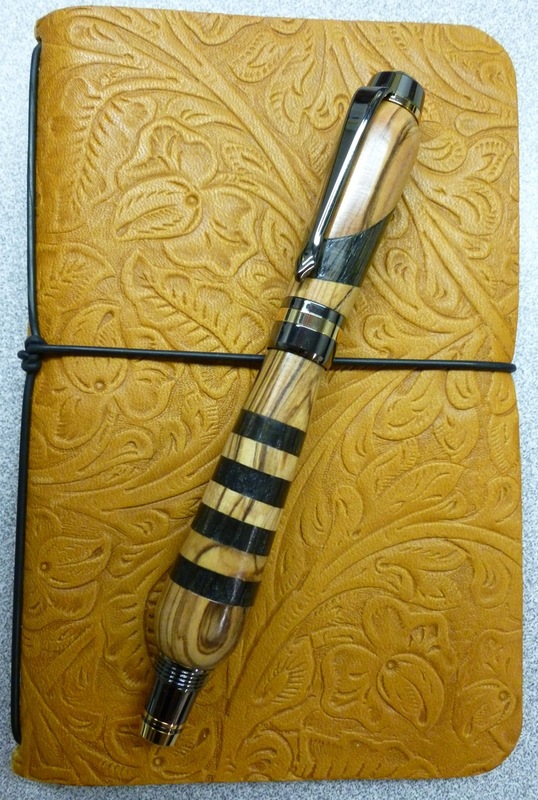 Full of ancient tales and untold secrets, the Dignitary is a pen that you can use to write your own stories.